1 Only the Bounty location by Fortuna is permanent. Others are unlocked temporarily when you capture Corpus Outpost. 2 K-Drive races currently active on the Orb Vallis. Map is no longer updated (see comments for potential updates from community). Races change daily at 0:00 UTC. 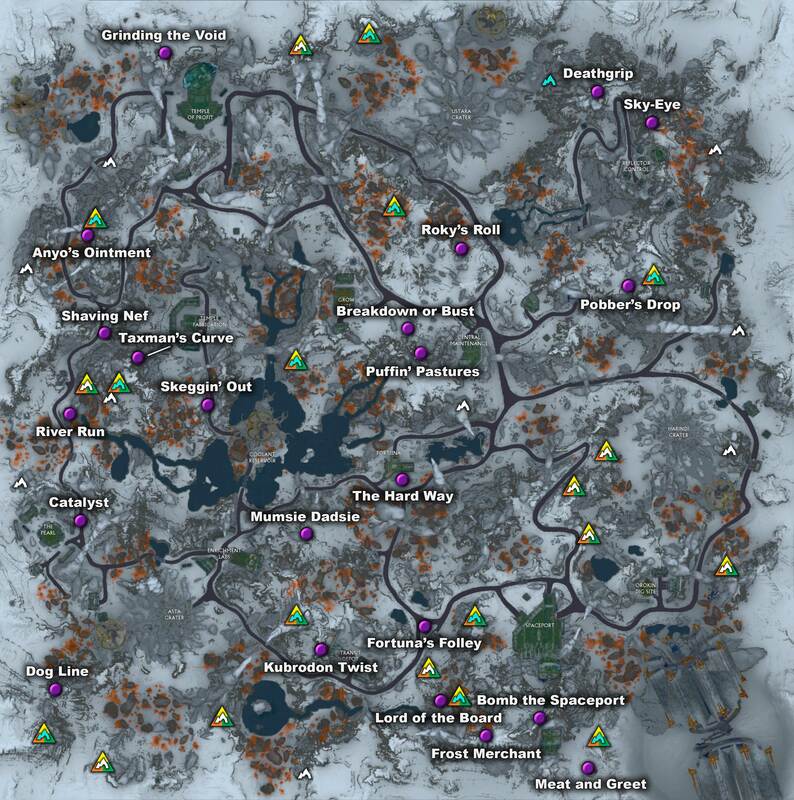 3 All possible races locations. 1 Some fish require hotspots to spawn. 2 Each species of Servofish has its own unique loot from dismantling. All fish provide scrap. don’t laugh, but I play warframe on the nintendo switch, so is the races the same for all platforms or what? I guess it might not. My bad then for not clarifying. Its for PC April 18th. Good lord, it’s been 3 weeks since River Run, thats all I need to finish this achievement, cmon DE. God bless you and others for posting daily races, though. Saves me the disappointment in logging on to see that River Run is still not in the rotation. I don’t know who you are, but you are my hero. There’s also a bounty location at the Transit Depot (Approximately South-East of the Kubrodon Twist race). These are the races for April 6th 2019 on PC. 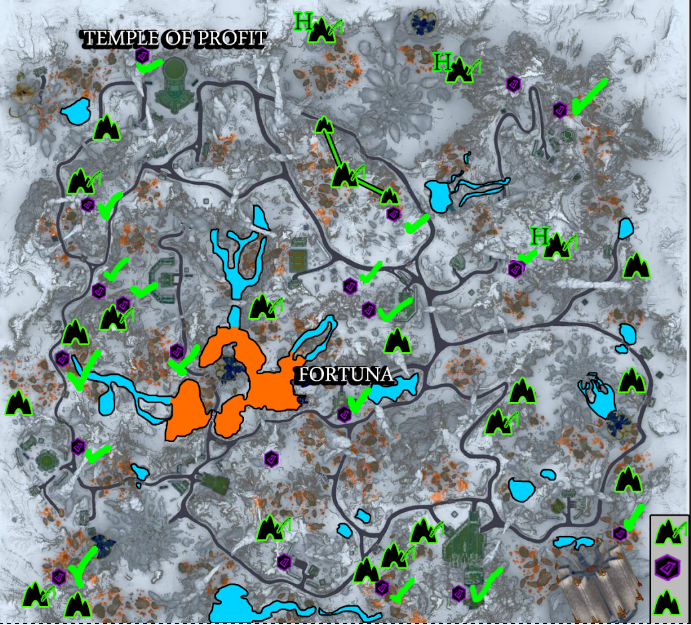 All K-Drive locations listed, April 5th, 2019. Oh god. Been waiting for 2 weeks and finally CATALYST. Thank you so much, everyone, for updating it daily. I needed Catalyst and Grinding the Void. This was a good day. I know this is long overdue, but we’ve finally added a map below the main one that includes all the K-Drive race names. I honestly didn’t expect the community to continue providing updates on active K-Drive races here in the comments. It is greatly appreciated, seriously. Happy racing! Just one more to go. Sadly I don’t know exactly which one I’m missing. This seems to be the only page I can see. Every other page gives me an Error 526 screen saying the origin web server does not have a valid SSL certificate. these races are out of date already though. Look at my newest comment for the updated races for 16 Mar 2019 . Great job, you beat me to it. Bewarned: I think Deathgrid bugged on me (xbox). In game notification appeared as a race I hadn’t previously completed, but achievement progress via xbox not showing the extra. Only time will tell. I might try to see if a pattern is emerging from the data we have. However I may not be updating this over the weekend as quick, ans at some point soon I’ll hopefully have the achievement and another kind Tenno will continue. So I took a look at the data from the past 13 days, and at the moment I cannot see a pattern other than there is no pattern yet. However a dataset of only 13 points is quite small. That being said, so much of the game is based around RNG I would not be surprised if the races are selected on an RNG basis too. This was based on the data generated from the races in the comments below. I will try to include this in future listing of races, now I know the work-a-around to the spam filter. Grinding The Void (Over by Nef’s headless statue, where the Exploiter Orb stomps around.) This race is particularly tough. Lots of spots to fall off your board, the Exploiter will open fire if it spots you, and the mini map doesn’t show the next time gate at some spots, and they aren’t immediately visible either. Just follow the orbs as best you can and follow your instincts otherwise. Truly, you’re a god amongst men! Hi! I understand it must be a lot of work to manually update the k-drive races daily, but can we have a separate map for k-drive races with their names? 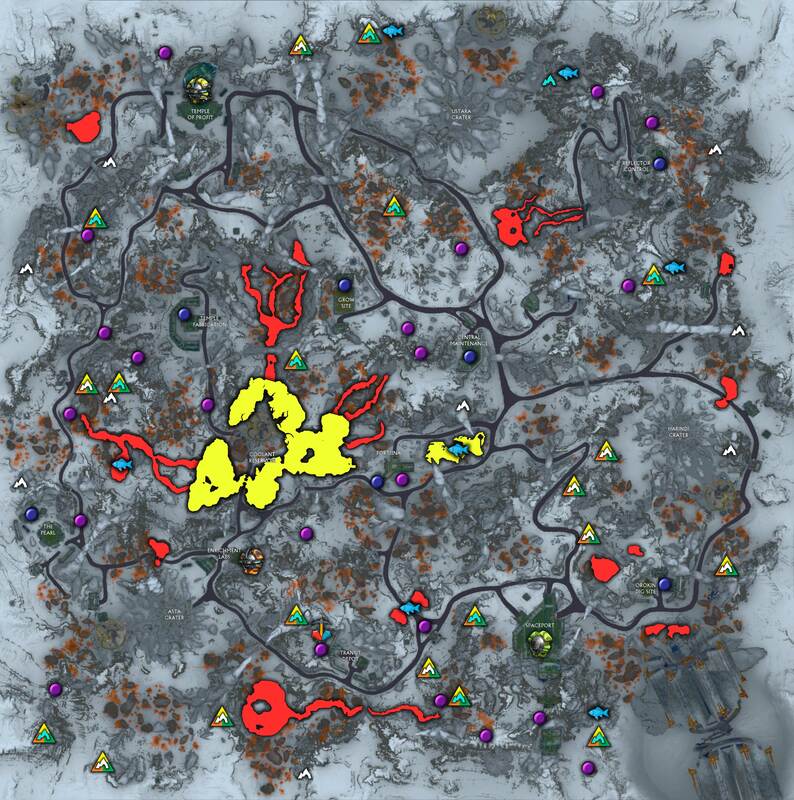 Appreciate the community for updating through comment section but because I’m not familiar with the names of each races, I still have to look around the whole map to find them. With the names present in the map it will at least be easier to get to each spots. Thank you! Hey man! I’m not sure if I can link urls in this comment section, but when you google “all 22 k-drive race locations” you should get a reddit thread as a result, which has a map with all the race names indicated on it. Hope that helps! Unfortunately due to time commitments, I cannot reliably update this map anymore for active K-Drive races on a daily basis (was doing it manually and was extremely irregular with the timing of the updates). Instead of haphazardly updating the map, I’ve decided to remove the active K-Drive feature entirely. I changed comments to sort by newest so hopefully community members such as DVNOO can provide updates (thank you by the way). Apologies for the inconvenience this may have caused all of you. I just found an item that can be scanned. It has the shape of a bebt-bond, and is located at a toroid spawn location in a cave. Are you going to add all the locations of them? Is there a reward for scanning them all like the glass fish in cetus? Sorry mate, map wasn’t updated today – you can always check the update date under the map. Whel you put cold for fishing does that mean during the freezing cycle or just the cold cycle ? After leaving and coming back 4 times, all loaded in. Just a whack DE flaw again. This map is very useful for ‘Race Ace’ achievement. Thank you very much. Have the Xbox races been separated from the PC races now? Or has the map not been updated for today? Because I have completely different active races than what is shown here. Meat and Greet and Lord of the Board were two I’ve found active on Xbox so far for today. The map says the latest date it’s been updated below it in the footnotes (uses UTC time), so you can see if it’s outdated there. The map was updated late today, apologies. FM, just ran a K-drive race on Xbox that’s ending point was at the 9PM position on an analog watch face right on what would be the western edge point of the Ustara Crater. The race itself was fairly straight with no major turns that I recall. The starting point must have been somewhere around 1-3PM on the other side N/NE/E of the crater. Sorry I cant be more specific, but it is definitely active. Counted as my 6th of 22 races. Disregard that, sorry. Starting location is the green dot south of Ustara Crater, west of what I call the “jellyfish lakes” (the red water locale on the map in that area). Anyways, it definitely is active. Bass – This race is already marked active on the map (that’s what the green dot means). Unless you’re just saying so we can confirm that Xbox races are same as PC? If so, thank you. It would be really nice if there was a column for the bait that is necessary for specific Servofish. Obviously Synathid comes from Synathid bait, but Eye-Eye spawns from “Narrow-Spectrum bait” for example. I’m on Xbox as well and can confirm the active races on PC match the active ones on console which is awesome. Do the active ones just change at reset or do they change more often (like every few hours or something)? That’s great to hear – They change once per day at reset (0:00 UTC). this is helpful for console players as well. many props for this man. AWESOME MAP! Thanks! Best i found. Only thing im missing is Lures needed for certain fish. Otherwise your map/guide is complete. Thanks Veno! I might have to find a way to add that in. I’m cautious of adding yet another column to the table since it’s already so massive, but might do so anyway. I appreciate you pointing that out! Not sure adding lures is really necessary since almost all of the the lures are specific to a single fish and are named the same as the fish. The common fish don’t need lures at all (even though you can technically buy them) since they’re easily found in large quantities without lures. That’s great to hear! Are you talking about the active K-Drive races too or just in general? That’s awesome, thank you for the information! Are all 30 caves on the map? It looks like I have all of them but my achievement sits at 29/30. Cant tell if my eyes arent working or if one is missing. All 30 are on map – There were issues with giving the achievement even if you had all 30 caves, though that was likely fixed by now. If you’re missing any, likely to be on edges on map or be some of the very small “caves” that are more like cubby holes (there’s 2 of those if I recall). Thanks FM, in the end I just had to go around to all of them, but I think like you said that the achievement took a while before it popped. Thanks for this map, extremely helpful. Do the races rotate based on some predetermined scheme or is it totally random? cuz I’ve been waiting for 1 race to pop up so I can finish my achievement for about two weeks now. 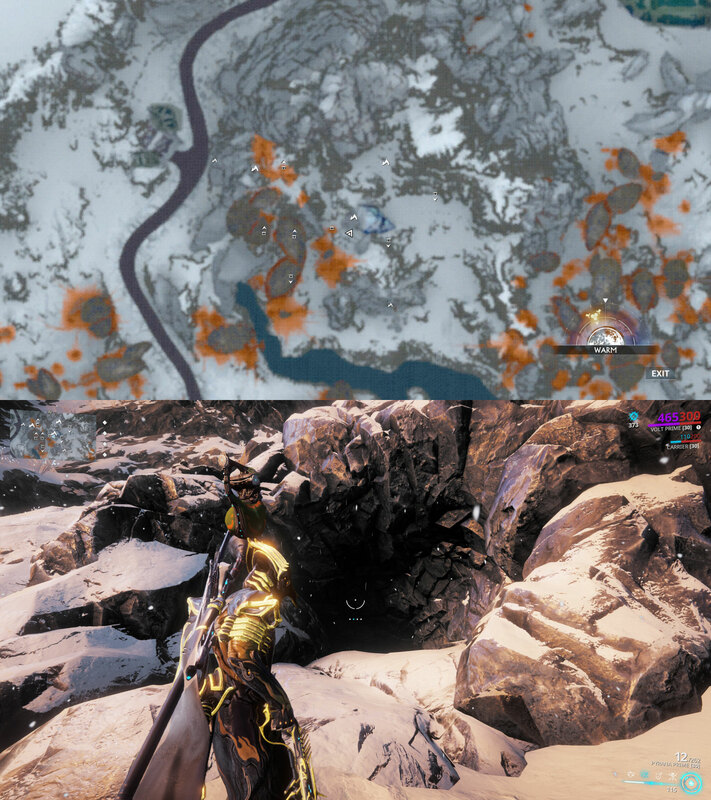 Not sure but the race I’m looking for is either the one directly under the toroid icon on spaceport, or the lonely race at the edge of the map near asta crater, 100% sure I’ve done every other race at least 2-3 times each now. Then it is the spaceport one then. Hope it pops up soon. Ty for the info. Lucky you – the race is live today! Yep Got my achievement finally. Thank you for all the dedication and hard work keeping this map updated ! I couldn’t have done it without you. thanks for the map. I have complete an achievement with you help! One of them is already there (by Transit Depot) and the second is northeast by Reflector Control, just waiting for it to be an active race before it is added to map. * That I’ve found so far. Update: All K-Drive races that exist are on the map now! Yes there are two missing – I know where both are, but I’m waiting to add them once they are confirmed so I can have their exact location in-game on the map plus be able to 100% confirm them. Thanks for posting! Thank you for your work ! Does a fishe near cave entrances means that the cave is good for fishing as well ? Yes it means the cave is a good fishing spot – Sorry it isn’t more clear! Very useful, it makes looking for the active k-drive races such a breeze! P.S: Got a solid laugh at your choice of e-mail! Thank you so much for this mao, I have found it to be very invaluable! I appreciate all the hard work you put into this for all of us. Thanks for taking the time to leave a comment and let me know it provided value for you – Comments like these make it worth it! Could you do the same table than for fishing but for mining ? You mean for the Standing you can receive from each gem? Or something else? Could you add Standing on the fish for turning them in? Going to add standing and scrap for each size as a separate table soon (or possibly extend out existing table if it doesn’t look too bad). Just a quick update – Fishing table is now updated for Scrap and Standing. Going to add that ASAP – Thanks for posting them! I also found one next to The Pearl which will be added soon too (the current purple one there is confirmed). Some big changes coming to map. Also sorry that your comment was held in moderation – Was automated for any comment with more than 2 links. Removed that restriction now (well moved it up to 20 which is as good as being removed). Thanks ! Will add that in as soon as I can. If you’re talking about the lower-right one of the three (below the fishing cave and in-between the 2 confirmed K-Drive races), then don’t worry as that’s normal. It’s more like a cubby than a cave – it’s barely large enough to fit your Warframe. Not sure why DE labeled it as a cave. Any chance for a screenshot? It’s the last one I need for the achievement and I searched for an hour this evening. Update: All K-Drive races are now on the map and confirmed – Thanks community!